You’ve probably heard of the debates surrounding whether or not certain statues of historical figures should continue to be proudly displayed. The reason for removing these statues is often that they’re celebrating historical figures that promoted and perpetuated oppression. Take the statue of Sir John A. Macdonald in Montreal’s Place du Canada, for example. 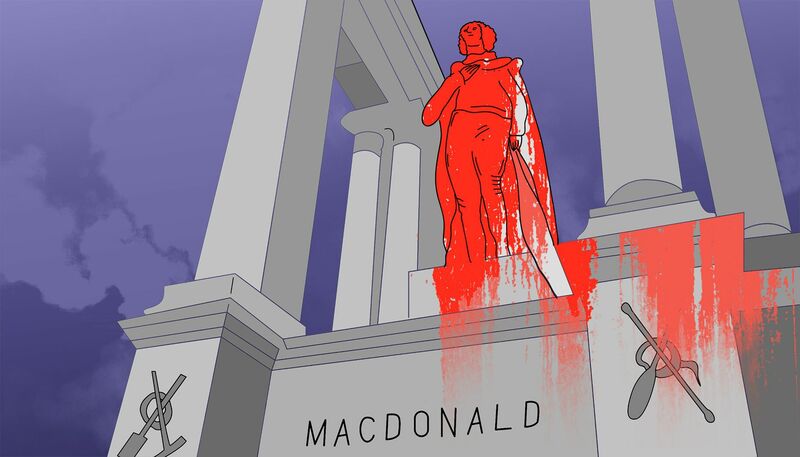 Just last week, a group identifying itself as part of #MacdonaldMustFall drenched the statue in red paint, according to the Montreal Gazette. To this day, many of the struggles Indigenous communities face in Canada can be seen as results of Macdonald’s legacy. How can we praise a leader who helped create these hardships? The same goes for Queen Victoria––how can we praise a leader who perpetuated oppression for so many around the world? How can we support colonialism, imperialism and repression of self-determination? The answer is, we can’t. And we won’t. We at The Concordian support groups who dedicate their lives to combating and resisting against symbols of oppression––symbols like statues, plaques or any other form of commemorating a hideous figure in history. The call to remove these statues reminds us of another event two years ago, where counter-demonstrators in Charlottesville, Virginia clashed with white supremacists who were protesting against the removal of a statue of Confederate icon General Robert E. Lee. The protest turned violent, with a car ploughing into the crowd of anti-racist and anti-fascist protestors, killing one and injuring 19 others, according to Al Jazeera. We at The Concordian believe statues of oppressive historical figures is one of the many ways white supremacy is still upheld in our society. We’re proud to see groups and people that fight against this in proactive ways, by choosing to attend anti-racism protests. We must remain vigilant, and we must become more outspoken against all forms of oppression. For those who think this is an old conversation, it’s too close to home for us to turn a blind eye—our current CAQ government is playing a role in upholding racist ideologies, by establishing values tests and French-language tests for immigrants. Canada’s complicit too—Barbara Perry, a professor at the University of Ontario Institute of Technology and an expert on hate groups in Canada, believes between 120-130 hate groups exist in Canada today, according to Al Jazeera. Unique, indeed. Uniquely terrifying, wrong and downright disgusting. We at The Concordian fiercely denounce all oppressive acts, figures and groups. We stand by those who fight against this systematic oppression and white supremacy that continues to see the light of day in our society.